Kegco's freestanding K309SS-3NK Triple Faucet Digital Kegerator can hold and dispense up to three home brew ball lock Cornelius kegs at a time, and has a beautiful stainless steel door that looks great in any decor. The Kegco K309SS-3NK has all of the features that you've come to appreciate from other high quality Kegco draft beer dispensers - like attractive styling, a removable easy-to-clean built-in drip tray, a chrome guardrail that prevents glasses from sliding off the top, easy rolling casters, and a 3-tap draft tower - as well as digital temperature controls that give you the ability to see your specific temperature setting and set it easily with the push of a button. 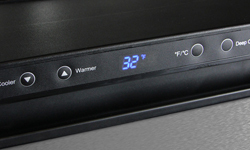 It also has a wider available temperature range for more precise temperature control. The digital temperature display and push button controls on this beer keg cooler make it easier than ever to set and verify the internal temperature. 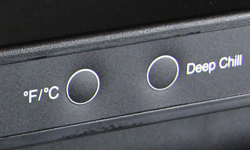 Instead of guessing what temperature a number on a dial will produce, you simply press the up or down button to adjust the temperature by one degree. The display can be set to either Fahrenheit or Celsius. Experience one of the coldest temperature ranges of any beer dispenser on the market today with this K309SS-3NK Beer Keg Dispenser. 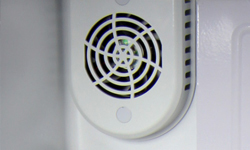 It has fan-forced cooling that provides even cooling throughout the unit. The temperature can be set as low as 32 degrees to dispense ice cold draft beer or kombucha. This keg beer cooler has a spacious interior that easily holds any full-size keg, including Miller kegs, Coors Kegs and rubber kegs. Because it can also hold up to two 5 gallon D system kegs or up to three 5 gallon Cornelius ball lock home brew kegs, you have the option to dispense more than one type of beer at a time. 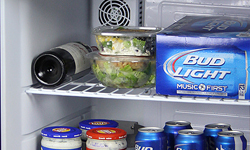 Simply push the Deep Chill button on this keg fridge to active the Deep Chill function. 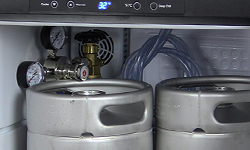 It quickly cools down a warm keg by forcing the compressor to work continuously for 24 hours. Press the Deep Chill button again when your keg has reached the desired temperature to return the unit to normal operation. This kegerator easily converts into a regular all refrigerator when you're not using it to dispense kegs, giving you extra refrigerated storage space. It comes with 2 adjustable shelves that can be spaced far enough apart to hold 2-liter bottles or gallon jugs, and thanks to the wide available temperature range, you can even use it to store wine. 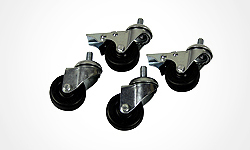 When it's time for game day or a backyard BBQ, easy-roll casters let you easily move the Kegco K309SS-3NK to wherever you need it. They lock once the unit is in position so that it won't roll again until you want it to. This keg beer dispenser comes with a triple tap draft tower with three faucets, faucet knobs, and three 5 foot lengths of 3/16" I.D. clear beer tubing. Choose from the optional add-ons below to customize a draft dispense system that's just right for you.